I had a crazy idea recently for a new game - a game that defines an entire new *genre* of computer game, and a new style of programming computer games. Whether or not this idea will go on to change the way all computer games are written, I will let history decide. It's such a simple idea that I don't know how it couldn't have possibly existed earlier. It doesn't require massive graphic capabilities, no CUDA NUMA GPGPGPU and the like -- it's an idea so profoundly simple that you'll be scraping your jaw off the floor with a spoon before you finish reading this blog post. You run the 'game' and it sets up a directory structure to represent every possible state of the game. To play the game, you inspect the current folder, look at the currently available sub folders, and choose which one to navigate into. Each sub folder you see represents the next possible state of the game. There is no executable program running when you are playing. The game is just your act of navigating the folder structure. It's a clever form of madness! 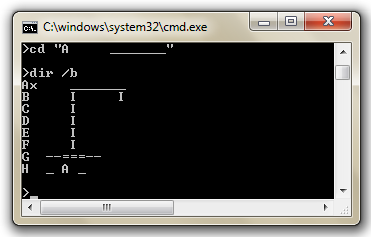 Here's some screenshots that show me playing the game, in a command prompt. I've changed my prompt to just a 'greater than' sign, by typing 'prompt $g', to make it cleaner. Old-school DOS wizards do this kind of thing all the time. Hipster kids, try and keep up. First I type 'dir /b' to get a clean view of the current folder. 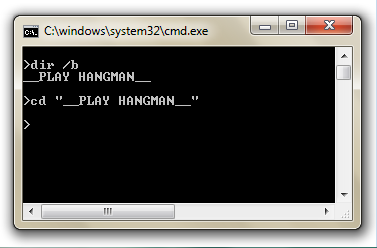 There is only one folder, '__PLAY HANGMAN__' so I navigate into it by typing 'cd[TAB][Enter]'. The game has begun. Looking in that folder I see the empty scaffold, three underscores (representing a 3 letter word) and the available letters listed down the left hand side. We're playing with a reduced alphabet to keep the number of permutations within a reasonable amount. My first guess is the letter 'A'. To make this guess I type 'cd A[tab]'. When I type 'dir /b' to inspect the new state of the game I see that it was a good guess, as one of the letters of the word has been filled in. Also there is an 'x' next to the 'A' indicating that that letter has been guessed. That's all there is to it. Hear that pop? That was your cerebellum exploding through your temporal lobe. The word is 'CAB'. There's no particular fanfare. Just the word 'WIN' declaring my victory. Okay, now you've seen the whole thing I hope you're aching to not just download the game, but to write your own entry into this brave new genre. You could do for Gehtto-Folder-Games what John Carmack did for first person shooters! I'd love to see an implementation of tic-tac-toe, aka, naughts and crosses. 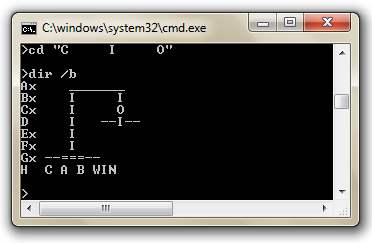 Also, hangman could be minified by using junctions (i.e. symbolic links) -- I'd love to see that implemented. The possibilities for new games are pretty much endless. Maybe six or seven. Okay let me level with you. The mathematics of this idea were just ridiculous. 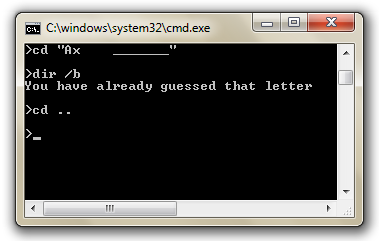 For a full 26 character alphabet, I would've killed my little computer. (Care to accurately calculate how many folders are created for the given alphabet?) It's all based around N-factorial where N is the size of the alphabet. Factorial is not something you want to see in the real world. 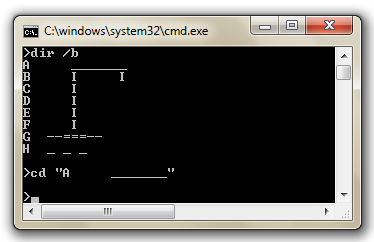 But the funnest bit was the ascii sprite code. Okay. Now you've been enlightened with the future of ultra-ghetto folder-based gaming, go ahead and make your own. I can wait.